Easter 2014 came and went, but the fond memories of family gathering together for church, Easter picnics, Easter egg hunts, and pictures linger. Pretty outfits and colorful baskets add to the fun of making this holiday special with children and grandchildren. Spending last Sunday with my daughter and little toddler granddaughter made my memory-making Easter one of the best! The funniest story I’ve heard about this Easter was about one boiled egg that is still hidden. What makes it funny is that one of my sweet family members let her granddaughter help her hide some eggs inside the house. Not the plastic ones but real, boiled eggs. The missing egg will reveal its hiding place soon when someone walks close enough to smell it. The lady of the house has already decided that plastic eggs will replace the real ones next year. When you have grandchildren helping you make holiday memories, all you’re thinking about is loving every minute of grandma time. What do you do with all the dyed boiled eggs after they’ve been discovered? Eat them all with salt and pepper? Or throw them away because you’re sick of smelling, dying, and hiding eggs? 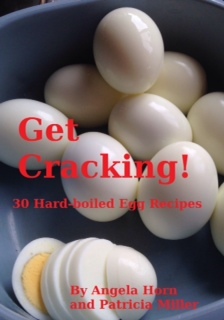 My food-blogging friend, Pattie, and I decided to write our own recipes for ideas on how to use those left over hard-boiled eggs. It’s an ebook called Get Cracking by Angela Horn and Pattie Miller. Got a special Easter recipe or story that you want to share? Once, when my brother and I were little, we were hunting easter eggs at my grandma’s house. We found an egg that had been lost since my mom was a little girl. My parent’s always counted the eggs and we found one more than they hid. My grandma took it outside and cracked it open. It didn’t smell bad like we thought it would. It was a shriveled up and dry inside. No one is sure how long it had been hidden before we found it, but we know it was a long time. Where can I find that book? Patti, click on the “Get Cracking” in red letters above and it will take you to the page where you can get a free sample and buy the ebook. Thanks! The recipes in the sample look really good.